The Mi Zone Nicholas Coverlet Set adds a fun splash of color to your bedroom décor. The quilted coverlet and sham(s) feature a color block design in navy, blue, grey and green hues printed on ultra-soft microfiber, for a simple and charming look. A decorative pillow with twill tape, in coordinating colors, is also included to complete the bedding set. Pre-washed with cotton-rich filling, this coverlet set provides exceptional comfort and a delightful update to your bedroom. Red, blues, gray and white make up this bright and colorful quilt. It has a durable and high quality feel and colors do not fade after washing. Perfect for you get or older child, guest room, or master bedroom. Pillow covers and accent pillow are an added bonus. This is a very nice coverlet. The material is so soft and the colors are true to the photo. I bought the twin for my son's room and the length and width are long enough to cover the sides of the mattress and then some. I found a simple bed skirt in navy to go with it. Easy to match the colors in the spread. I couldn't be happier! 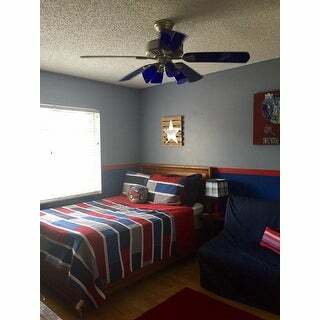 Quite nice coverlet - great for boy's room! Got this for our elementary age son when moving him to a new room. We'd painted the walls a light grey even before ordering this coverlet set, and the grey in the coverlet ended up matching perfectly. The red, blues, grey, and white in this coverlet are great together and the block patchwork are masculine without being overbearing. It is 100% polyester, but it's a matte (v. sheen) almost microfiber like softness. It lays well on the bed and looks very nice. We got the full/queen for a full bed and there is ample overhang on the sides, though not as much as in the stock photo. Appreciate a throw pillow was included. Only reason not giving a 5-star review is unknown durability, and there were some loose threads that needed to be picked off or cut. Would recommend and buy again. I bought this set in Full/Queen size for a Full bed. It fits perfect and covers all the sides of my pre-teen son's platform bed. I washed it first and even dried it at low temperature. The set came out intact and ready for a good night sleep. It is not very warm if the house temperature goes lower than 73grF, so I'll recommended it only for warm seasons or as a bedspread. 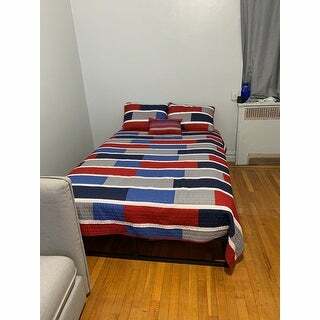 I also bought matching sheets in red color (Super Soft Solid Deep Pocket Easy-Care Sheet Set with Oversize Flat), and, even if I am more inclined to get cotton for my family, I have to say I am impressed by the quality of the quilt set and also the sheets. They keep you cool during the night and no sweating. I ordered this for my son's bedroom and we all love it. The fabric is of nice quality, the colors are bold, and it's cozy to sleep under. The matching shams and rectangular throw pillow are of the same good quality. I got the full/queen set and it fits nicely. I would recommend this set. Ordered this Coverlet and was not disappointed the colors are great and it is so soft even without washing it. I ordered this for my Grandson who is 7 and he can't wait to have this on his bed, also this is a coverlet that he can grow up with also. Thank You overstock for selling high quality items, this is the 5th thing I have ordered and not been disappointed yet. Colors are great. Bought this for a room with bunk beds and they look great I bought the grey blue and green set and I was worried that the colors would be weird but they looked just like the photo. This is for our young teen boy's room. It is perfect! Very good quality at great price! Bought for my son and we both love it. Quilt is not too heavy to use all year and sheets are soft and smooth. Seems to be laundering well. our toddler loves his new bedding. its soft and warm. the colors are true and pretty. I washed it before putting on his bed and there were A LOT of red fuzzies in the dryer. The color didnt ruin any other clothes or bleed to the other colors on the bedding. We got this for my teenage son, and it lays well on the bed and looks great on his twin bed. Purchased this coverlet for my teenaged son. colors are vibrant. material is soft and washes well. would have liked to had a window valance or tie backs that matched. this is an adorable quilt set that we purchased for extra when we have guest. it looks bright and colorful. it washes and wears very nicely. i would recommend to anyone. This quilt is a perfect fit for my son’s bed. He loves how soft and smooth it is. It seems to be very good quality and durable. It is only a quilt so it is thinner than a comforter. He gets colder faster in the winter, but it will be great for the summer time. Overall it’s a good deal and good purchase. Brought this for my sons bunk bed set and it adds brightness to his room. Had the set for about 2 years and it has held up really nicely and doesn't show dirt. I would recommend. "Are matching sheet sets available ?" No but I saw a couple of the colors on some sheets sets Overstock had and bought them. They look great. "Does the color fade after regular washing? I have something similar that has faded horribly after a year." As with most fabrics, it may fade slightly over time after a few washings, however, that should be minimal as it is made of 100% polyester. "Does this coverlet hold a separately purchased down comforter or is it without the pocket?" This comforter does not have a pocket to hold a down comforter. It is more of a quilt style.